DARTFORD, KENT – 8 August 2014 – Elsewhen Press, an independent UK publisher specialising in Speculative Fiction, is delighted to announce that the next book in the Royal Sorceress series is available from today as an eBook. 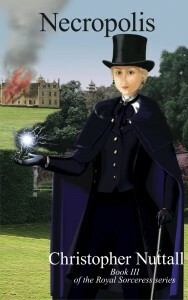 Necropolis is the third book in this fantasy series, hugely popular with readers of alternative history and steampunk as well as fantasy, from author Christopher Nuttall who is ranked by Amazon as one of the bestselling authors of Science Fiction and Fantasy. The Royal Sorceress series has been widely praised, with Risingshadow describing the first book as “one of the most interesting and entertaining alternate history books ever written” and the character of Lady Gwen as “one of the most intriguing heroines in modern fantasy”. Available on popular eBook platforms, Necropolis will be published in November in a paperback edition. Christopher Nuttall has been planning sci-fi books since he learned to read. Born and raised in Edinburgh, Chris created an alternate history website and eventually graduated to writing full-sized novels. Studying history independently allowed him to develop worlds that hung together and provided a base for storytelling. After graduating from university, Chris started writing full-time. As an indie author he has self-published a number of novels, but this is his sixth fantasy to be published by Elsewhen Press, and the third in the Royal Sorceress series about Lady Gwendolyn Crichton. The first was The Royal Sorceress, followed by The Great Game. Necropolis continues Gwen’s story. Chris is currently living in Borneo with his wife, muse, and critic Aisha.